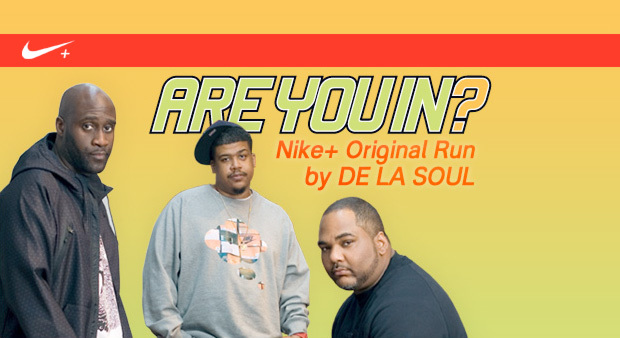 From Nike, the world’s leading sports brand, comes an exclusive release by De La Soul, one of the most influential hip hop bands of the last two decades. Commemorating the 20th Anniversary of 3 Feet High and Rising, De La Soul and Nike release ARE YOU IN? : Nike+ Original Run, which is the groups’ first-released original material in five-years. The record is only available through iTunes, and is part of a continuing series of releases through the “Nike+ Sport Music” section of the store. With additional production by Chicago-based DJ/Production-duo Flosstradamus, ARE YOU IN? : Nike+ Original Run is a unique album written specifically for runners, but its allure extends to all music fans. Posdnuos of De La Soul explains, “When we first heard about this project we were psyched on the challenge. We pride ourselves on being able to get bodies moving, so it was cool to do it with a specific goal in mind – giving runners the sonic fuel to clock some miles.” The album is now available at the Apple iTunes Music Store. Nike Debuts Two Air Max 97 & Air Max Plus Hybrids in "Orewood Brown"